When wives or girlfriends utter the phrase “Let’s go shopping!” on a Saturday afternoon, husbands and boyfriends may groan at the thought of the impending boredom, or find themselves suddenly paralyzed by the fear of hours on end in the women’s section of local department stores. 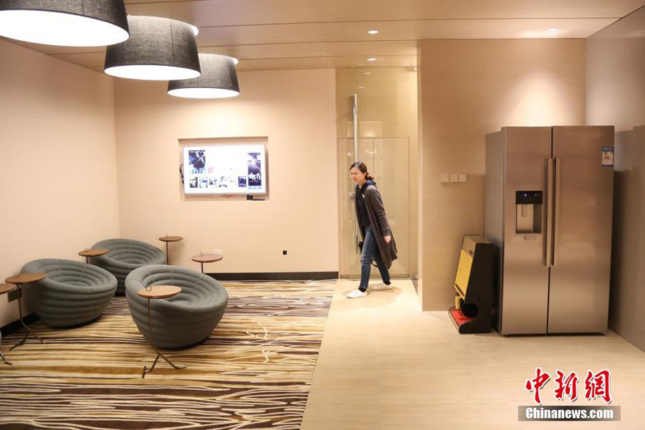 In an effort to create a more pleasant mall experience for both genders, the Vanke Mall in Shanghai recently opened a “Husband Nursery.” The space (originally reported on by China Daily) is equipped with lounge chairs, a massage chair, a television, a fridge, magazines, and newspapers. Husbands and boyfriends can relax while their wives and girlfriends are cruising the shopping floors. When those ladies are all spent and ready to go, they’ll know where to find their significant others. Located in Qibao, a smaller town in the Minhang District of Shanghai, Vanke Mall also offers a Tree House playground for kids.